I have berries on the brain this week. Walking around the Farmer’s Market on Saturday mornings, I cannot help but notice how beautiful all the berries are. And, of course, they are tasty. 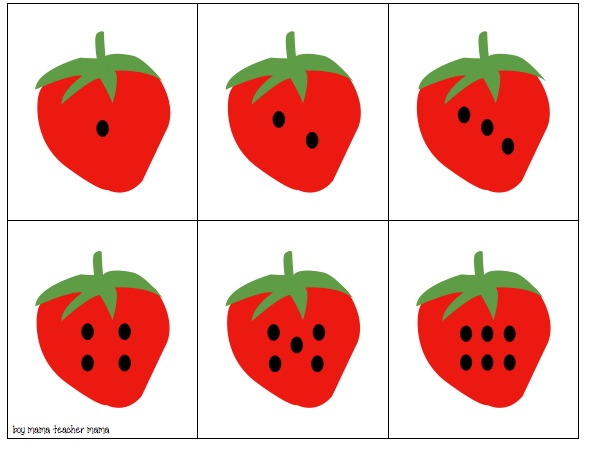 So as I was “drawing” some strawberries on my computer this evening and was adding the seeds, I thought, “Hey! 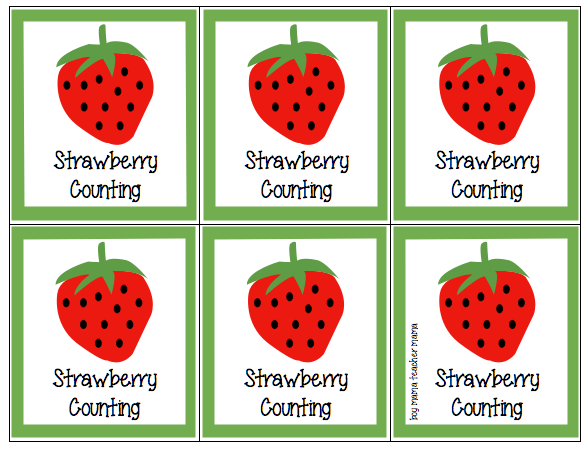 A counting game.” If you like it, simply click on the images to download, print, cut and enjoy. 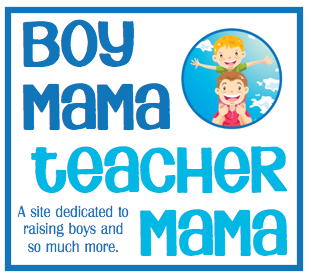 Simply download the images and print them out. Ideally, they should be printed back to back on card stock so one side is the number side and the other is the decorative front side. When downloaded, the front of the cards will be upside down so both sides of the cards face the same direction when printed. Not important, but makes them prettier! 🙂 The card stock will make them more durable. The possibilities are endless really, but here are some suggestions. Many of these games will require you two print 2 sets of the cards. These games are all great not only for number recognition and counting, but also visual memory! Memory: Mix up the the cards using only the dot number cards, the numeral cards or both. Lay them out face down in front of the players and take turns trying to make pairs. Dice Roll: Lay the cards face up in front of the players. One player rolls the die and has to match his roll to either the numeral card or the matching dot card. Seed Match: Grab some beans or other small counters. 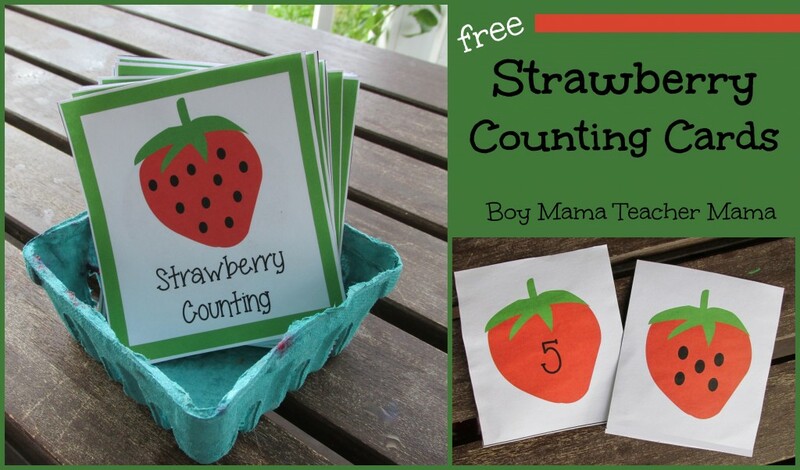 Lay the dot cards out and have your child add bean to each strawberry while counting. Complete the Count: Give each player 3 cards. Have the player with number 1 start bu laying his card down face up, then the player with card 2 puts his card next to card one and so one until all six cards are face up in order. Pretty simple game, but great for counting! 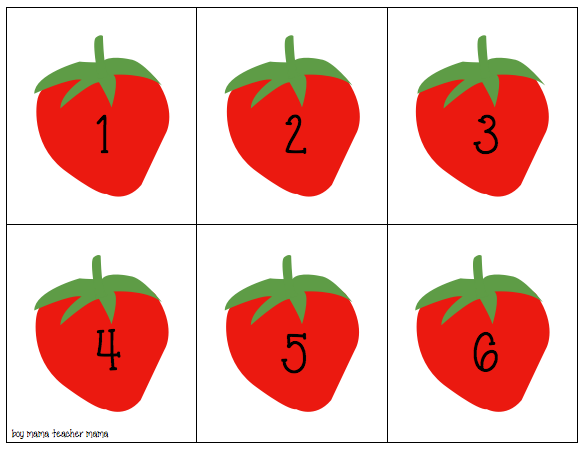 Adding/Subtracting Seeds: Grab 2 cards and add or subtract the number of seeds. More or Less: Place 2 cards face up and determine which number is more and which is less. Go Fish, Old Maid, Snap are also good options.